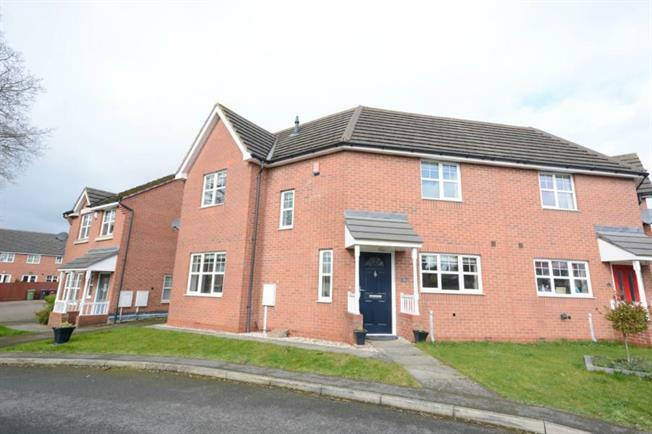 3 Bedroom Semi Detached House For Sale in Chesterfield for Guide Price £150,000. Three bedroom semi-detached property with off street parking and garage in the ever popular area of Danesmoor. Benefitting from a range of popular local amenities and public transport links this well presented property truly needs to be viewed to be fully appreciate the standard of the accomadation on offer. The property briefly comprises of entrance door leads into the hall with access to the living room. The kitchen has a range of wall and base units and fitted appliances. The ground floor also benefits from a toilet with wash hand basin. There is access leading from the living room and the kitchen to the rear garden. Stairs lead to the first floor and the three bedrooms with the master bedroom having an en suite with w.c, wash hand basin and shower. The family bathroom is also on the first floor and benefits from w.c, wash hand basin and bath. To the front of the property there is off street parking and a garage to the side of the property. To the rear the garden is mainly laid to lawn with a paved seating area. To arrange your viewing on this property please call Blundells now on 01246 208 768.